1. Anti-police violence demonstrators briefly shut down traffic on Interstate 980 last night as they protested the killing of a man by Oakland police yesterday. According to the Chron, police say they shot and killed a robbery suspect who was brandishing a firearm after a chase to West Oakland. The man’s identity has not been released — nor has the identity of the officers who killed him. It was the third fatal shooting by OPD in the past two months after the department had not shot anyone for two years. 2. Climate scientists said today that the odds of a massive El Niño weather event this year remain at 90 percent, and that temperatures in the Western Pacific are about as high as they were during the torrential rainstorms of 1997-98 and 1982-83, the Chron reports. However, scientists are also unsure about the effects of another warm water phenomena in the Northern Pacific known as the “blob.” The blob has been associated with California’s punishing drought and it’s unclear whether it will lessen or strengthen the effects of El Niño. 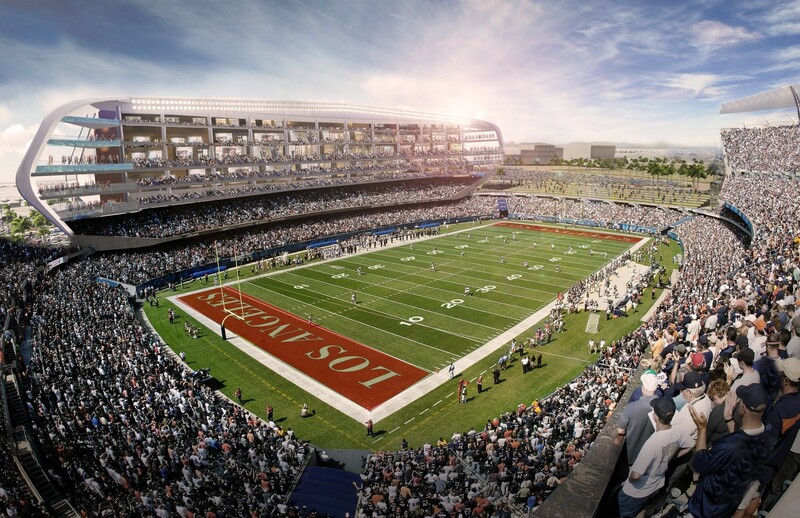 The Oakland Raiders' proposed stadium in Southern California. 3. The Bay Area News Group$ notes that while Oakland officials have taking the blame for the Raiders' possible move to Los Angels, the team has yet to offer a viable plan for building a new stadium in Oakland — and seems to be more focused on relocating to Southern California. 4. As librarians protested the destruction of books by the Berkeley Public Library, Jeff Scott, director of the library, admitted that he had badly misstated the number of items discarded by the library so far this year — it was more than 39,000 rather than then the couple of thousand that Scott had originally stated, Berkeleyside reports. 5. Caught in a bureaucratic nightmare, scores of students throughout state are being denied admission to the California State University system this year for not passing the high school exit exam, even though the state stopped administering the test last year, the Chron$ reports. 6. Anti-tax Republican George Runner, the vice chair of the State Board of Equalization, is pushing to increase taxes on medical cannabis in California, the Chron$ reports. 7. And bombastic billionaire Donald Trump continues to hold a sizeable lead in the Republican presidential nomination polls in Iowa, the Washington Post$ reports, citing a new CNN survey.